I sit in the corner, quietly observing the group, hoping no one talks to me and asks me how I am. I’ve been dreading this day for weeks. I am not really sure what the etiquette of baby showers is. I’ve learned about wedding, birthday parties, funerals and baptism etiquettes, but as a Brit living in the US, baby showers are new to me. One thing I do know for sure is that sobbing away in the corner, trying to make sure no one sees is not part of the celebrations. Why all the tears? Because this should be my time for my baby shower. I don’t mean to sound self-centred, but you see we have been trying to conceive for 17 months now. Like the singleton table set aside at weddings, baby showers should come with a table reserved for infertiles. After all, 1 in 8 couples of reproductive age could have a seat at this table. My tears are short lived, of course, as the excitement of adorable ‘mini-me’ baby gifts and funny games take the course of the day. Our friend who has that beautiful pregnancy glow to her skin, was happy. So happy. For me this was all I needed to prevent me from drowning in my own misery and enjoy the party. I would have held her hand, hugged her and told her it’s OK, I understand, we can face this disease together. But for some people experiencing infertility, a hug from a stranger will never make the pain and hurt go away. I know this. I feel more comfortable on my infertility journey than I ever have been because I discovered a place where hugging strangers is quite a common place. The blogging world. I have been surprised to discover comfort and understanding from the ‘virtual’ hugs, support, discussion and love from the biggest group of ‘strangers’ I know. It’s not just strangers that have joined us on our journey, but a small group of family and friends too. The ability to communicate, open my heart and share my feelings has been a therapy for me. But not everyone we care about knows of our struggles because it is not easy to talk about. Please help us on our journey. As it is infertility awareness week, we are taking a big leap and inviting you to join us on our journey – or more aptly put – the hunt for the great pudding club. You have been invited because we trust and love you. We want you to know that this week we will be starting a new chapter in our journey. Ironically it is National Infertility Awareness Week. We have been diagnosed with unexplained infertility, it is a surprisingly common diagnosis for about 25% of those with infertility. To date we have tried three rounds of artificial insemination, known as IUI (Intra Uterine Insemination). This week has been particularly difficult for us as our final prescribed round of treatment failed. With each round of treatment the sad news of our failure does not get any easier to digest, rather, the sadness stacks up and our hearts grow heavier. We are now at the cross roads stage where we do not know exactly which route we will take: IVF, gestational carrier, adoption or even child-free. Whichever route we do decide to take, we want you to be there with us. Ask us how we are doing, and if we do not to tell you every intricate detail of our treatment, please don’t be offended. Sometimes we just don’t want to talk about it because we have been thinking about it all morning and just stopped thinking about it. We love hearing stories about how your little one was conceived, especially the funny stories. But please do not tell us that we should try this position, or that method. After all, I am pretty sure we have tried everything we could possibly google. Legs up, from behind, on top, downward dog, on holiday, when drunk, herbal tea, with a full moon etc… The chances are slim that we will be able to conceive naturally. Although telling us about your friend that conceived after X time, with X procedure might seem affirming, everyone with infertility is different and so your story probably won’t apply to our situation. The obstacles each one of us faces will be different and the path we take will be unique. Please don’t ask us 14 days after our fertility treatment procedure if it worked. If it worked, we will tell you in our own time if we find out I am pregnant (it won’t be long after we find out, I am sure the excitement will be too much! ); if it didn’t work, we need some time for ourselves to contemplate our next steps and to just have a big old cry. We like emails, phone calls, skypes and messages that remind us that there are other things going on in the world. We don’t want to think about infertility and babies all the time. It can be emotionally exhausting at times. Send us photos, tell us funny stories or pass on a couple of memes. Please don’t feel like you are treading on egg shells around us or worry that we are too busy to speak to you. Finally, please don’t suggest ‘You can just adopt’ to us. If you look into adoption you will quickly learn that this process is not easy, cheap or free from emotional baggage. There are no guarantees. The casual statement of ‘you can just adopt’ makes it seem like not being able to conceive isn’t that big of a deal and ironically is often said by people who already have their own children. Such a casual, throw away statement makes the whole process seem like we can simply go to the store and pick the type of baby we want from the range on the shelves. The list above is specific to us, not everyone who suffers infertility will feel comfortable with what we are suggesting, each couple will deal with it in a different way, so if you know someone else who is going through this you should ask them how you can help. Regardless of the individual items on people’s lists, one thing we can all do is be cautious, being a little more sensitive and take a little time to think before asking anyone about having children. If you know a couple that has recently married it is easy to ask ‘so when will we hear the pitter patter of tiny feet, eh?’ but what if the couple is struggling to conceive? Such an innocent question and yet it could be devastating. We’re not saying don’t ask questions, just don’t make assumptions. Until we had gone through this experience I would often be the one asking such questions, I only realise now how hurtful those questions could have been. Come join us, support National Infertility Awareness Week by adding a twibbon to your facebook profile. You can follow my blog or facebook page, read the links below to help understand more about infertility. 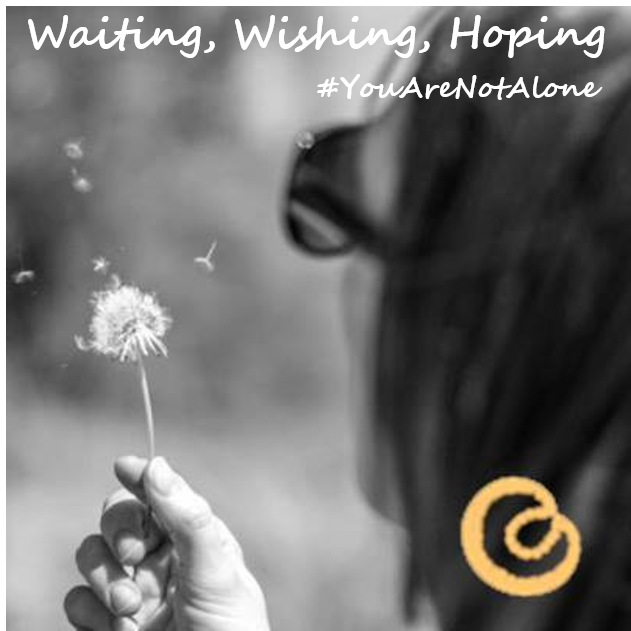 Share your awareness so that others who quietly suffer do not feel like they are alone. Thank you for understanding as we go through some challenging decisions and supporting us, giving us hope like you have already, we feel very much loved in the knowledge that we are not alone on our journey. Thank you for this post and for always reminding me that I am not alone. Fantastic post!! You are not alone, all us crazy blog strangers love you and think of you constantly!! BIG virtual hugs coming at ya! Sorry I’m late to the party, but I’ve been reading your story (is that weird?). Whilst we’re not trying I am surprised by insensitivity from people. It’s almost as if once you pass your first anniversary your family plans are everyone’s business. Constantly we get ‘so when are you having kids’ or ‘that’ll be you next’, but the truth is it won’t because we’re both on medication that mean we can’t get pregnant for the forseable future. I know it’s by no means close to the same but it still hurts as things are out of our control and the comments are thoughtless. Why don’t people think. I absolutely agree that as soon as you have been married for 5 minutes it’s an expectation that you will be pregnant. I myself was once one of those annoying people, but I only learned this was a bad thing after experiencing infertility. You will be amazing parents in a time that is right for you, and we will support you guys with whatever you decide to do now and in the future.